...that Captain James Cutter has an illegitimate son named Daniel Clayton? This article is about the leader of the Jiralhanae species in the Covenant. For the lesser and standard Chieftain rank, see Jiralhanae Chieftain. The Chieftain of the Jiralhanae was the central political and military leader within the Jiralhanae contingent of the Covenant, responsible for representing their interests in the Covenant. Following the Great Schism, this position ultimately became the supreme military leadership of the Covenant, replacing powerful Sangheili ranks such as Imperial Admiral. During the First Battle of Harvest in February of 2525, Captain Tartarus killed his uncle Maccabeus in combat and proclaimed himself the chieftain of his clan. Following the engagement, Tartarus began to gain authority throughout the entire Rh'tol skein. Tartarus' quick ascension in power and influence caught the eye of the High Prophet of Truth. The two worked together throughout the Human-Covenant War to replace the Sangheili with the Jiralhanae in the Covenant military; Truth believed the Jiralhanae were easier to control than the Sangheili, while Tartarus despised the species. Late in the war, the Prophet of Truth elevated Tartarus to a position of power over the Jiralhanae and established the title "Chieftain of the Jiralhanae". On November 2, 2552, after the High Prophet of Regret's death, the remaining Hierarchs recommissioned the Covenant Honor Guard and replaced the Sangheili Honor Guardsmen with Jiralhanae. The next day, Truth put Tartarus in control of the entire Covenant military as its military chief. The Chieftain of the Jiralhanae had some members of his species under his command that were prepared to help him in his coup against the Sangheili. Upon receiving the orders of Truth, Tartarus initiated the Great Schism by betraying Arbiter Thel 'Vadamee. The civil war led to the fragmentation of the Covenant. After receiving the blessing of Truth, Tartarus attempted to activate Installation 05 with its activation index, but he was ultimately killed by the Arbiter at the installation's Control Room. After learning of Tartarus' death, a power vacuum was created that many Jiralhanae commanders sought to fill. Chieftain Cethegus, who had accompanied Truth to Installation 00, believed that if he could kill Spartan-II Master Chief Petty Officer John-117 at the installation, Truth would elevate him to the title of Chieftain of the Jiralhanae. However, he was ultimately killed by the Spartan in combat. While a Jiralhanae Chieftain controlled a relatively small pack or clan, the Chieftain of the Jiralhanae had authority over every member of the race, and essentially functioned as the commander-in-chief of the Jiralhanae. While holding the title, Tartarus served as the right hand of the High Prophet of Truth and was in command of the Hierarch's personal guard. The Chieftain of the Jiralhanae was able to attend sessions of the High Council, where he stood near the Hierarchs. 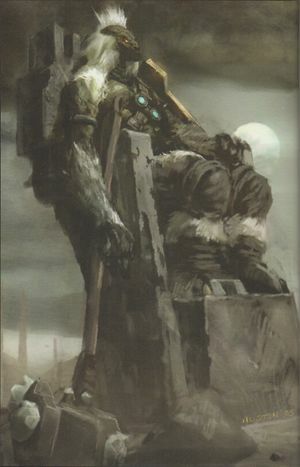 After Supreme Commander Thel 'Vadamee was convicted for his failure to protect Installation 04, Tartarus was charged with caring out his torture. The Chieftain was also occasionally issued with missions of high importance, such as aiding Arbiter Thel 'Vadamee assassinate Sesa 'Refumee or retrieving the activation index of Installation 05. When the Chieftain of the Jiralhanae was present, Truth often dismissed his Sangheili Honor Guardsmen, who remained unaware of the Chieftain's and the Hierarch's intentions. After the Changing of the Guard, the Chieftain of the Jiralhanae was elevated into a position that had command over the entirety of the Covenant military. Tartarus, the only known Chieftain of the Jiralhanae. Tartarus attending a High Council session. The Chieftain of the Jiralhanae carrying out Thel 'Vadamee's punishment. Tartarus with his Gravity Hammer, The Fist of Rukt.